Generates a signal containing a Gaussian-modulated sinusoidal pattern. Drop in power on either side of the center frequency. attenuation must be greater than zero. 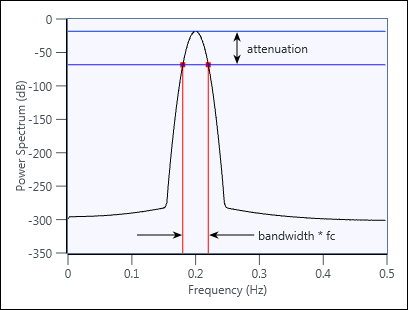 Value multiplied by the value of the center frequency to normalize the bandwidth at the attenuation in the power spectrum. This input must be greater than zero. In its power spectrum, at frequency point fc, the power spectrum density reaches the peak value π k . When at frequency points f c ± b * f c 2 , the power spectrum density decreases q dB from the peak value, where q denotes attenuation, as shown by the following figure.